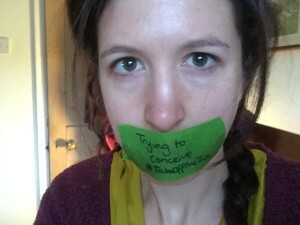 Mind has been asking people to #TakeOffTheTape and share something that makes them anxious. Something they haven’t spoken about before. I thought I would use the opportunity to write about something that’s hardly spoken about at all. I’m finding it incredibly hard to balance trying to conceive with managing my mental health. We don’t talk about this. We don’t even talk about the first twelve weeks of pregnancy much (as I’m well aware from my work with the Miscarriage Association). Trying to conceive often happens in almost complete secrecy. I didn’t realise how it would interact with my fluctuating mental health and I wasn’t prepared. It’s taken a while to get to this stage. The doctor who removed my coil last year strongly implied that it would be best to continue with my efforts to come off my Citalopram. She moved me to Sertraline (it’s considered safer in pregnancy) and told me to try and reduce my dose completely over the next month. In fact it took me three more months. I’ve been trying to come off anti depressants for a while anyway (after a muddled fifteen year relationship with them) and trying to conceive gave me the strength to make it through a hideous withdrawal period. It was probably the hardest thing I have ever done. Alex didn’t have much fun either. I’ve written about it here. I’m more vulnerable to hormonal changes now. I still have very dark times when everything seems hopeless and I can’t see a way through the next ten minutes let alone the rest of my life. Difficult images and ideas jostle with an endless repetition of fears and doubts. Sometimes the same phrase over and over again. They whisper just below the surface of my consciousness. They’re loud enough to wear me down and shrink my focus to a single point of constant worry – but not quite conscious enough for me to recognise what’s happening in a way that helps me stop. One these days I’m separated from the world by thick glass that bounces every negative thought straight back at me, infinitely magnified. My attention is forced inwards but my mind is everywhere but present, infecting all it can with worst case scenarios. I can’t look up and out, can’t see the variety of the world and my place in it, can’t take a long deep breath. My chest physically hurts and I feel constantly sick with the fight or flight chemicals flooding my poisoned body as it tries to deal with the powerful threat of my mind. These times are getting further apart and each one adds detail to our understanding of the best way to manage them. But trying to conceive has made my anxiety worse. It’s given it another peg to hang its hat on. Issues with eating and body image are often about control (with an emphasis on control over your body) – and anxiety hates uncertainty. But trying to conceive is a very uncertain time. What my body does – and doesn’t do – isn’t completely under my control. I was managing my mental health to the extent I felt I was in a position to come off medication – in order to do something that has made the problem worse again. The irony isn’t lost on me – although on bad days it just makes me want to cry. This entry was posted in All posts, Writing my mind and tagged #TakeOffTheTape, Anti Depressants, Anxiety, Citalopram, Depression, Exercise, Exercise addiction, Hormones, Medication, Mental Health, Mind, Stigma, withdrawal on March 17, 2016 by fostress. 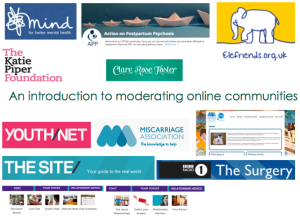 This week I travelled up to Leeds to run a workshop I called ‘An introduction to moderating online communities’. It was attended by three groups associated with Leeds Mind. All of them were thinking about online peer support. Some had a platform built and in testing. Others were still figuring out what, if anything, they wanted to offer. The session was designed to give a basic overview of those important questions and decisions that anyone setting up an online peer support community should consider. We also explored the benefits and risks of some of the options available and started to think about the needs of specific communities. I started the presentation by posing a list of key questions which we considered throughout the session. I thought I’d pose them here too. What is the problem? Why? What is your experience? These are questions you should be asking people from the very beginning. Without it you risk making expensive mistakes and creating products people don’t want or need. Talk to people. Test your assumptions. Don’t just ask what people want. Ask why they want it and then consider different options for solving that problem. Create something small and test it out. Keep on asking, reviewing and making changes – what people say and what they do in practice can be quite different. Next we went back to basics and defined our terms. Moderation, safeguarding, peer support, engagement – these can sometimes mean different things to different people. We can’t make useful decisions until we’re all talking about the same thing. What kind of moderation do we want? 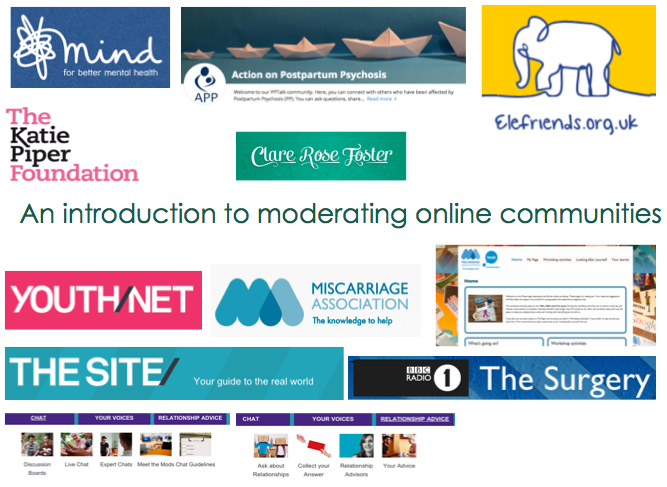 In defining community moderation we came up with a number of different types (including pre and post moderation) and a number of different roles that a moderator could have (including ‘policing’, providing support and facilitating peer support). We discussed what these might look like in practice. This entry was posted in Current & Recent Projects, Online support & communities, Training & online learning, Work & Projects and tagged Community Moderation, Online, Online Community, Online Support, Peer Support on March 10, 2016 by fostress.